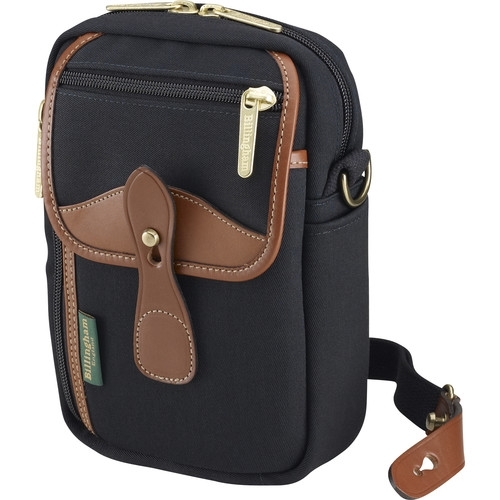 Carry your compact or mirrorless camera or simply your travel necessities in this black Airline Stowaway Bag. Trimmed with tan leather, the Airline provides ample storage and organization within its many zippered and slip pockets. A front flap features a small zippered pocket for memory cards or spare batteries for your camera, while a larger front zippered pocket can safely store your passport or smartphone and headphones for easy access as you navigate your way through the airport. A main compartment with a double-pull zipper protects your compact or mirrorless camera system. A rear slip pocket provides the perfect place for maps or a thin travel journal while a couple of pens can be stored at the ready in the side slip pockets. Webbing loops on the rear of the bag easily fit on your belt or a detachable shoulder strap allows you to sling this bag over one shoulder.